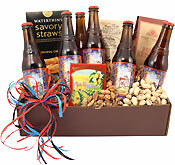 You never know what sweet and salty treats you'll unwrap with this loaded beer gift box. 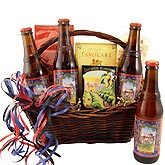 While the Fat Tire is all that your loved one may see when they first peek into their present, the overload of pub-quality treats will hit the spot when the munchies take hold. 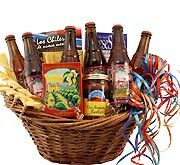 While there's enough goodness to share with a friend or two, your recipient is more likely to hide away and indulge all alone. I know very little about beer but purchased this for my husband for Father's Day. He was very pleased with the beer and he said it was a good kind to pick. He's also enjoying all the snacks that come with it. Packaged came already to give as a present with a pretty bow around it. Delivery was fast and speedy and nothing was broken because it was packaged so well. My husband is always out of town on business on our anniversary. So, I like to send him care packages to his hotel. This one was the best one yet! He was the envy of all of his colleagues. He especially enjoyed the beer brittle. He posted a pic on FB and said I am "The Best Wife Ever" I will be ordering again and again. Thank you so much! This was a gift for a 21st Birthday. It was fun, the munchies were the right amount and tasty, the brews we're classy, and it wasn't over the top on alcohol. My nephew was so surprised and actually honored someone gave him a gift like this to celebrate this milestone. Good purchase and I looked like a fun yet responsible aunt. Bought this for my son-in-law, who fancies himself a beer taster. He loved the taste and enjoyed all the beer snacks. I would use this site again for special gifts. Great gift!!! Reasonably priced!! Arrived early and was SO HARD to wait to give gift!!! She was VERY HAPPY when she opened beautifully wrapped gift!!! Was sent to daughter and son in law for Christmas! Absolutely loved it! Will definitely be purchasing from Beer Gifts again. Thank you! 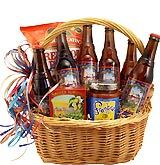 Got this basket for my father in laws Birthday(a guy who has everything), he loved it!!! pleased with the Beer gift sent to my son for Christmas..
Great gift. Arrived as stated in the ad.